Another shot of Mülheim’s Luisenschule, this time from one of the three main entrances along the long hallway which connects the square main building to the one you see in the distance. The hallway is known as the teacher’s hallway because the staff rooms are there and the younger pupils are not supposed to go through there. The building it connects to was constructed a couple of years after the main part, still in the 1950s, but has since been known as the Neubau, the new building! All the science and art rooms are in there – I think it was physics in the cellar, chemistry in the middle and biology and music on the top floor. 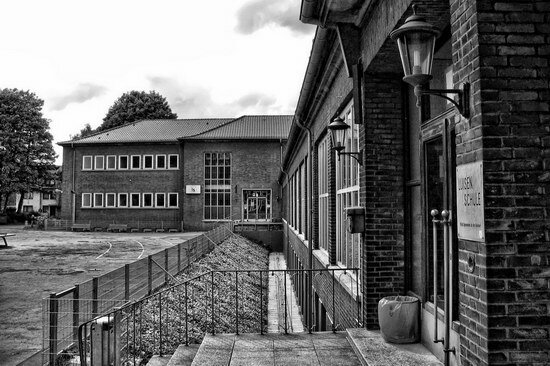 These are actually in the wing of the building on the right, the left one you see in this photo only has some additional classrooms and the toilets :-).